I am always surprised at how many of the kids with whom I work are 5, 12, and 15. 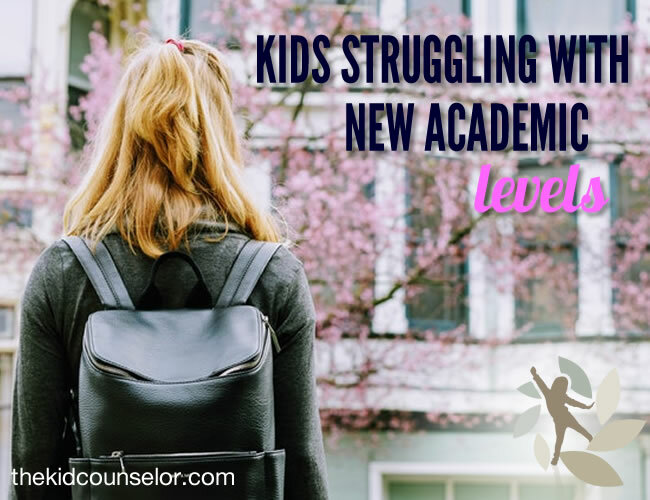 And although it seems like those ages have nothing in common, the thread that ties them together is that they all represent the shift to a new academic level: kindergarten, sixth grade, and ninth grade. For some kids, they are able to adjust quickly and it causes them little if any issues; for others, it is very challenging to navigate a new set of expectations, peers, responsibilities, and rules. Elementary school marks a major shift in independence, whether or not the child is ready for it or likes it. Often up until kindergarten kids have been babied and nurtured, either at home with parents or in daycare. Kindergarten requires that kids be more independent, and more self-reliant. Sometimes, kids really struggle with the difference and begin to exhibit changes in behavior or emotions. And there are usually academic indicators that the child is trying to make sense of a new environment and not feeling comfortable with it. Middle school is such a drastic shift in kids’ realities, as they leave the protection and safety of elementary school and are thrust into a sea of indifference. Not only do they go from being the oldest and biggest to the smallest and youngest, but they are also required to manage class changes, different teachers, more homework, and more intensive academic work. Add to all of this hormonal changes with the start of puberty and physical changes as they mature into adolescence, it becomes a perfect storm of difficulty. You can usually spot these struggles with withdrawal from once loved activities, aggression or outbursts, emotional ups and downs, or increased anxieties. These three transitions are very challenging for some kids, especially those who do not regulate their emotions well or those who are hard on themselves. Through (play) therapy, they are able to work through their anxieties, frustrations, fears, and disappointments so that they are well-adjusted for the new academic setting in which they find themselves. And of course, the more aware you are about why they are struggling, the better you can help ease much of the confusion about the new, until it just becomes “new normal” instead. Previous to becoming a full-time Mom, Brenna ran a highly successful Child Therapy Private Practice. Brenna has been blogging and writing articles on implementing Play Therapy in Parenting since 2006. Brenna finished her PhD from the University of South Florida in 2015, and re-opened her private practice in early 2016, seeing children from 3-14 and conducting parent training classes online and in-person.